As of last Friday, I have an empty nest...My last child left for college. This is new for me as I have had children at home since 1979. How am I doing? Okay... Older children moved to the Twin Cities and are 300 miles away, and youngest is only 100 miles away. She will be home for the Labor Day weekend but then not again until the second weekend in October as she is on the college women's golf team and they golf fall and spring in Minnesota. On Sunday afternoon my husband disappeared for a few hours. I thought he had probably went to mow the lawn at our hunting cabin. But no, he was at an auction sale. He likes auction sales. He is a collector of vintage fishing lures and rods and reels. But, he bought two things just for me. And you know how I love garden junk!!!!!!!! A very rusty old cultivator. 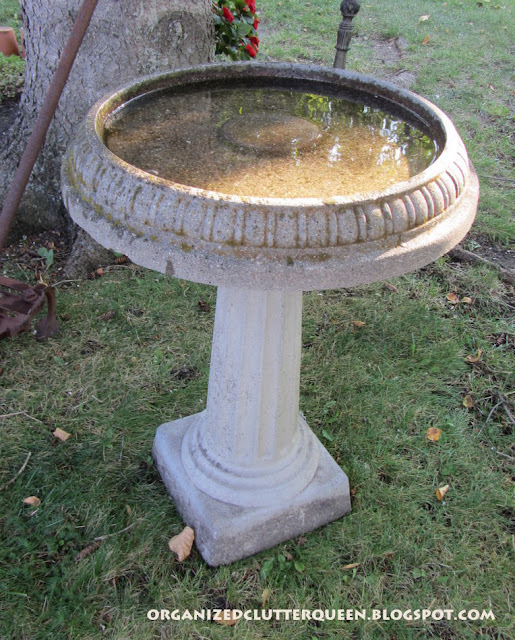 And, this great cement bird bath, complete with patina and a little moss. And a terra cotta/cobalt blue bird bath that used to hang in a tree by a chain, but is now perched atop an upside down, large terra cotta pot. This bird bath started out full of rocks and the birds loved to drink out of it. Especially the finches, but what happened to the rest of the rocks? Squirrels? They are also frequent drinkers. Mr. Organized Clutter took me by surprise! So good that you share some of the same interests....junk. Love your new things. What a thoughtful husband! It kind of takes the sting out of having an empty nest. 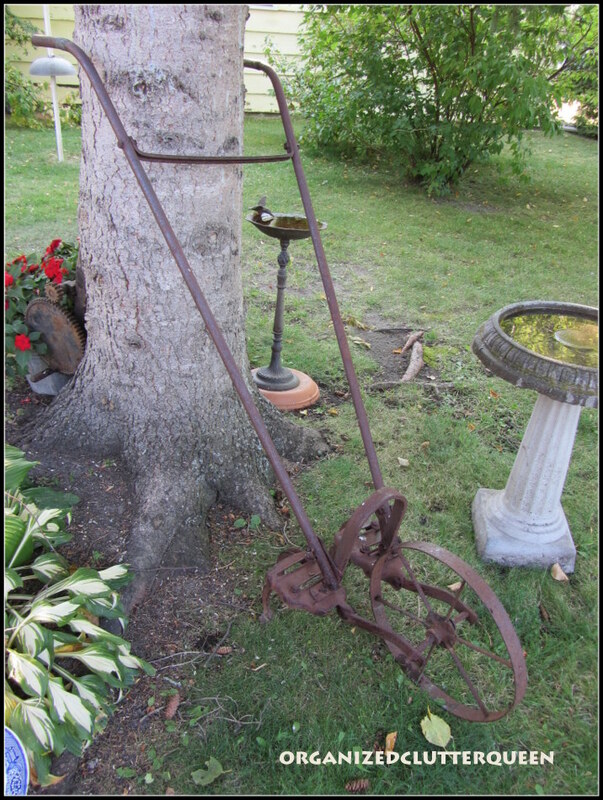 The cultivator will look perfect with autumn garden decor! What a guy! Great finds! Looks like your husband is a keeper & knows exactly what you like. Enjoy your newest treasures! I just love when a husband does those little surprise treats....he definately knows what you like and probably that you needed a little picker upper!! left home and they are all very far from me..
maybe like me, you will never get used to it..
How thoughtful of your husband!! I love garden treasures. My daughter (only child) started college this fall also, and even though she is commuting I still feel that 'empty nest' as she is very much her own person now. I think that may be why I am so blue as of late. Isn't it great having a husband that just knows what you love?! I can relate with the empty nest syndrome. I'm still trying to navigate through it. Funny, it isn't like I dreamed it would be, when they were all home. yes he is so sweet and thoughtful. I love that cobalt color. What a sweet hubby! Very cute additions to your garden, I love the character they add!! Love all your beautiful treasures for your garden. What a wonderful husband. Thanks for sharing. O, don't you just LOVE surprises like that. What a sweet fella he must be. 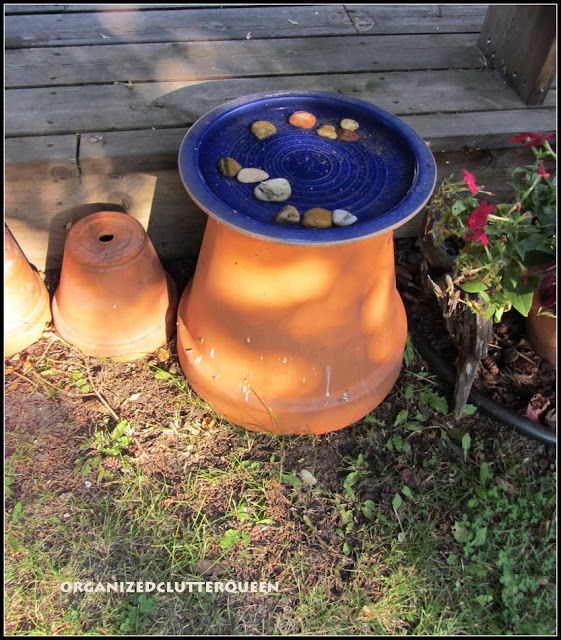 Oh how I love bird baths and I think I have more than a dozen scattered about the yard. Love the cement one with the time-used look. What a nice husband. If Mr. Z. did that I would be shocked beyond belief. You have such a "sweet" husband to bring back these two treasures for your garden. See you next week. Hi Carlene....You'll get used to the empty nest syndrome. It's not easy but it gets better. Loved the birdbath. You know what? 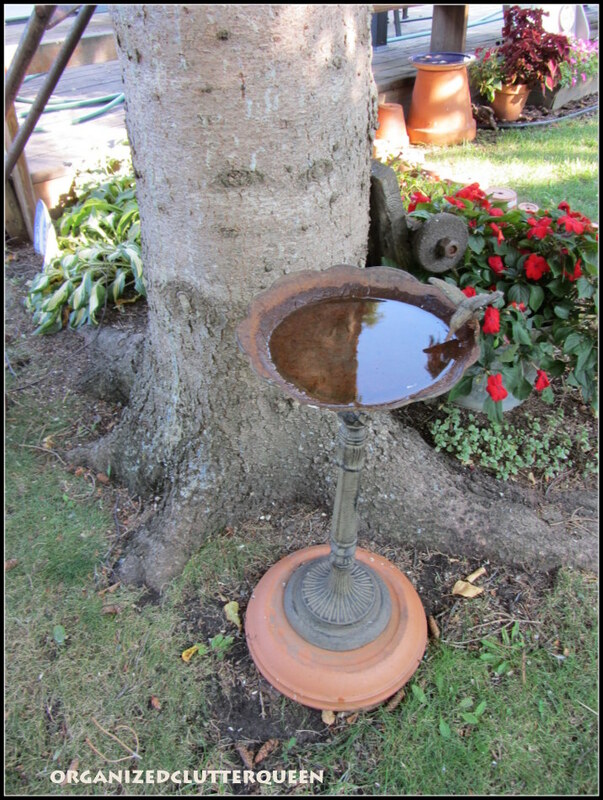 I have two birdbaths in the yard but no birds come at all. I think the presence of our cat is the major deterrent. The "boidies" think, "uh uh. I'm not going to be his lunch." Sad but true. Your husband was cultivating his love for you! Wow, that's so sweet! Oh the empty nest...I hope you find your way as you adjust. Mr. O.C. is a real keeper! What fun garden treasures! And what a fun suprise to get! Thank you for sharing last week at TTF. Have a fantastic day!